As experienced event photographers in Los Angeles, we know that our clients expect the best, particularly when celebrities and sponsors are involved. 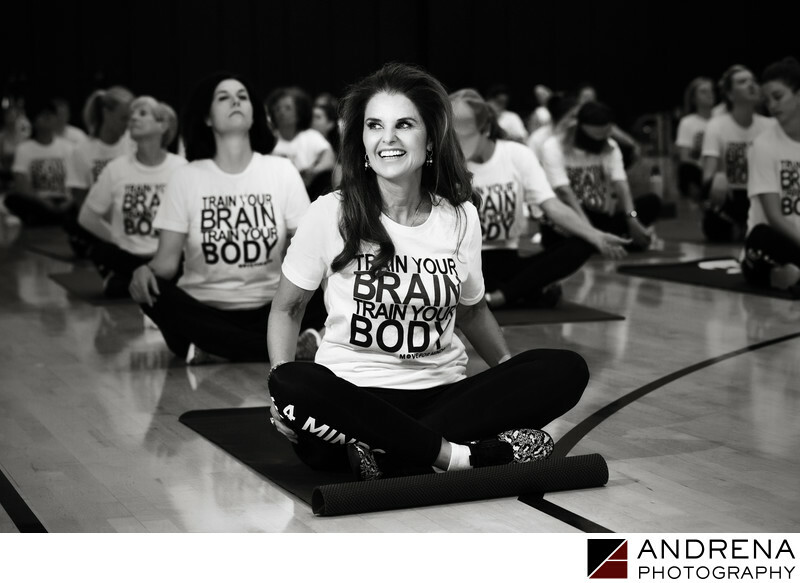 Maria Shriver has long been an advocate for prevention of Alzheimer's disease, and her Women's Alzheimer's Movement foundation does events throughout the year that are focused on educating the public on ways to prevent this horrible disease. Maria's father, Sargent Shriver, suffers from Alzheimer's, which spurred Maria's interest in the diet/movement/mind relationship to this condition. The Move for Minds event took place in eight cities on the same day, and invited participants to do a structured workout as well as listen to a panel discussion with various experts in the field of Alzheimer's prevention. Guests included actor Sean Hayes; Dr. David Perlmutter, author of "Grain Brain," and model and spokesperson Christina Ferrari. Various sponsors exhibited their wares in a trade show format, giving attendees the opportunity to view health-based products focused on continual wellness.